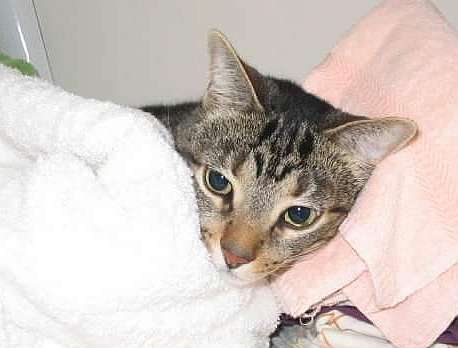 On Aug. 22, 2011, my husband and I returned home from our European vacation and went to pick up our 7 year old pet cat named Dusky from our daughter’s house in the downtown area. We live uptown. When Dusky was put into the car in his carrying case, he somehow managed to push open the latch door of the case and run out the open doors of the car. The three of us, my husband, daughter and I, pursued him but because he was so scared he just took off and we couldn’t find him. This was an unfamiliar area for him so we were very worried he wouldn’t find his way back to our daughter’s house. We searched for him every evening and week-end for several weeks without any results. We put up posters and notified all the animal shelters which sent us daily pictures of cats that were brought to them as ‘found’ cats. Lost pet named Dusky. Has anyone seen him?